Awaiting the birth of a child is a special time filled with excitement and anticipation. But when things don’t go as planned and a child suffers an injury during labor and delivery, it is devastating. It’s even worse if the injury was due to a medical professional’s negligence. Henry Ford made Ford’s headquarters in Dearborn, Michigan. When the city became too industrialized (largely due to the Ford plant), Ford created a “town” with horse-drawn carriages that reminded him of his childhood. He even recreated his childhood home in this town within Dearborn, and the town was named Greenfield Village. Greenfield Village still exists in Dearborn, and people travel hundreds of miles to see this great town that makes people feel as if they’ve stepped into the late 1800s, early 1900s. Dearborn is also home to the very large Oakwood Health System, and Oakwood’s hospitals and clinics are located throughout metro Detroit. Oakwood hospitals have won numerous awards, including one for their pediatric department. Even award-winning hospitals, however, can be the site of medical malpractice and injuries to newborn babies. If your child experienced a birth injury and now has seizures, HIE, brain damage, cerebral palsy or any other long-term condition, contact Reiter & Walsh today at 888-419-2229. Our award-winning Dearborn, Michigan birth injury attorneys are available 24/7 to speak with you. Nuchal cord: This occurs when the umbilical cord is in a knot around the baby’s neck. This can cause the cord to be occluded, which will significantly decrease the flow of oxygen-rich blood to the baby. In addition the knot can be so tight around the neck it impinges on the baby’s neck vessels, which leads to decreased oxygen going to the baby’s brain. Preeclampsia: This is when the mother has high blood pressure (hypertension). When hypertension occurs, there can be decreased flow of blood to the baby. There are a number of ways hypertension can cause this. One way is that the high blood pressure causes damage to or constriction of the vessels in the placenta. When this happens, there is decreased flow of oxygen-rich blood to the baby through the placenta and umbilical cord. Umbilical cord prolapse: This occurs when the cord travels down through the birth canal in front of the baby. When this happens, the baby’s body and mother’s pelvis push on the cord. This pressure on the cord can cause blood flow to the baby to slow down or completely stop. Cord prolapse is an obstetrical emergency, and when it happens, the baby must be delivered immediately, usually by C-section. Post-term pregnancy: When a baby is in the womb for longer than 37 weeks, postmaturity syndrome may occur, which results from the uterus and placenta becoming insufficient due to the deterioration of the placenta. The placenta starts to gradually deteriorate after week 37, and then it may not be able to supply adequate oxygen-rich blood to the baby. Chorioamnionitis and villitis: Chorioamnionitis is infection and inflammation of the placenta and fetal membranes. Villitis is infection and inflammation of the part of the placenta that is involved in gas (oxygen,etc.) and nutrient exchange, and is associated with chronic chorioamnionitis. These conditions can cause premature rupture of the membranes (PROM), which can cause serious problems for the baby, including premature birth and being born before the lungs are fully developed, which can cause oxygen deprivation in the baby. Meconium aspiration: This is when the baby breathes meconium into her lungs around the time of birth. Meconium is a mixture of amniotic fluid and the baby’s first stool. When a baby gets meconium into her lungs, she can suffer severe respiratory distress and have breathing problems after birth, which can cause oxygen deprivation. Macrosomia (large baby) / cephalopelvic disproportion (CPD) (baby too large for mother’s pelvis due to large baby and / or small pelvis): When a baby is macrosomic, she is more susceptible to a traumatic birth, which can include the use of forceps and vacuum extractors. Trauma can cause hemorrhages / brain bleeds, which can cause a lack of oxygen in the brain. In addition, the prolonged labor that can occur with macrosomia and CPD also increases the chance of oxygen deprivation. If a mother has gestational diabetes, she has an increased chance of having a macrosomic baby. Placental Abruption: This occurs when the placenta separates from the uterus, which can cause bleeding in the mother and a decreased supply of oxygen-rich blood to the baby. It also can cause the placenta (and umbilical cord) to be cut off from the mother’s blood supply, either partially or completely. This can cause oxygen deprivation in the baby. Uterine Rupture: This is when the uterus (womb) tears open, potentially expelling the unborn baby out of the womb and into the mother’s abdomen. When the uterus tears, the mother may lose so much blood that it deprives the baby of oxygen-rich blood. Or the rupture can cause the placenta and cord to be cut off from circulation, which also deprives the baby of oxygen. Women who have a vaginal birth after C-section (VBAC) are at an increased risk of uterine rupture. Malposition of the baby, such as face presentation and breech birth: When a baby is not in the normal position (top of the head exiting the birth canal first), labor can be prolonged, trauma to the head can occur, and the umbilical cord can become prolapsed. These complications can cause oxygen deprivation in the baby’s brain. In addition, babies in face presentation can suffer from a lot of swelling and fluid build up in their upper airways, which can cause respiratory distress and oxygen deprivation. Delayed emergency C-section: Research shows that when the decision to perform a C-section is made, the baby should be delivered in 18 minutes or less, in most cases. Experts also agree that in other instances, such as a cord prolapse, the baby should be delivered much sooner. Often, physicians spend too much time trying to deliver a baby vaginally, and they do not move on to a C-section quickly enough, or they lack the skill or necessary equipment to promptly perform a C-section. When an indicated C-section is not timely performed, the baby is many times left in oxygen-depriving conditions for far too long. Severe maternal hypotension (very low blood pressure): When a mother’s blood pressure is low, the blood flowing from her, through the placenta and umbilical cord to the baby, may be insufficient. This can deprive the baby of oxygen-rich blood. Intracranial and intraventricular hemorrhage: Hemorrhages (brain bleeds) can occur when there is trauma to the baby’s head. This can happen during labor and delivery, especially if delivery instruments such as forceps and vacuum extractors are used, or the baby’s birth position (face presentation, breech birth) is mismanaged. Brain bleeds can cause decreased blood flow and oxygen in the brain. Traumatic delivery, which can occur when forceps or vacuum extractors are used, and when shoulder dystocia occurs. Trauma can cause brain bleeds, which can cause oxygen deprivation. In addition, shoulder dystocia can cause trauma to the head and prolonged labor, which also can cause the baby to have brain bleeds and be oxygen deprived. Shoulder dystocia / Erb’s palsy: Shoulder dystocia occurs when the baby’s shoulder gets stuck on the mother’s pelvis during delivery. Sometimes physicians mishandle this condition and pull too hard on the baby’s head, which can cause the nerves in the baby’s neck and shoulder area to be torn or severely stretched. This can cause partial or full paralysis of the arm, a condition called Erb’s palsy. When a child has Erb’s palsy, the arm just hangs limply at her side. Excessively strong and frequent uterine contractions, called hyperstimulation, can result from improper use of Pitocin or Cytotec: Hyperstimulation can cause the uterus to contract too frequently and strongly. Strong and frequent contractions put continuous pressure on the vessels in the uterus and placenta, which impedes blood flow from the placenta to the umbilical cord and baby. This can lead to severe oxygen deprivation. Improper management of the baby’s respiratory status after birth: This includes failure to properly manage apnea (periods of breathing cessation), failure to properly manage a baby on a breathing machine (which can cause overventilation injuries, such as hypocarbia and a hole or holes in the lungs), and failure to give proper amounts of surfactant, which helps with lung maturity and lung compliance in premature lungs. Anesthesia mistakes during labor and delivery can cause blood pressure problems in the mother, including a hypotensive crisis. Birth injuries are often a result of medical errors or medical professionals not adhering to standards of care. When this occurs, families may be eligible for compensation to cover medical costs, costs of assistive devices, lost wages, education, housing and other expenses related to the injury. Birth injury cases are highly complex and require substantial knowledge of obstetric, gynecologic, neurologic, and pediatric issues. The attorney that you choose for a birth injury case needs to have this depth of knowledge in order to best serve your child. Additionally, the lawyer should have highly qualified experts in each various fields to review records and help determine exactly what went wrong. If you have given birth at Oakwood Annapolis Hospital in Dearborn, MI or another hospital in the Dearborn area and you or your child were injured during the labor and delivery process, Reiter & Walsh ABC Law Centers can help. Unlike other law firms, we focus solely on birth injury cases and have for over 28 years. Our Dearborn, Michigan birth injury attorneys possess a depth of knowledge about birth injuries that few other attorneys in the state have. Over the years our Dearborn, Michigan birth injury attorneys have accumulated an impressive panel of nationally recognized obstetricians, neonatologists, neurologists, lifecare specialists, therapists and other experts that will work tirelessly on your case to determine where negligence occurred, who was responsible, and how to best serve the medical and financial needs of your child. 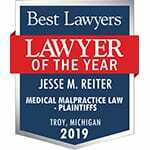 Our firm is consistently recognized by legal publications for having the top verdicts and settlements in the state of Michigan. If your child was diagnosed with a birth injury, such as cerebral palsy, a seizure disorder or hypoxic ischemic encephalopathy (HIE), the award winning birth injury lawyers at ABC Law Centers can help. We have helped children throughout the country obtain compensation for lifelong treatment, therapy and a secure future, and we give personal attention to each child and family we represent. Our nationally recognized birth injury firm has numerous multi-million dollar verdicts and settlements that attest to our success and no fees are ever paid to our firm ­until we win your case. Email or call Reiter & Walsh ABC Law Centers at 888-419-2229 for a free case evaluation. Our firm’s award-winning Dearborn, Michigan birth injury attorneys are available 24 / 7 to speak with you. Watch a video of Dearborn, Michigan birth injury attorneys Jesse Reiter and Rebecca Walsh discussing birth asphyxia, hypoxic ischemic encephalopathy (HIE) and the long-term effects these birth injuries have on children.